Album In A Day volume 10 - 22 August 2015 - BFW recordings netlabel - ambient shoegaze indie experimental electronica - music is free! An album of songs written and recorded in one day! On Saturday 22nd August 2015, musicians from around the world each wrote and recorded a complete new song, from scratch in one day. The next day, these songs were collected and put together as an album. The day after that, the album was released as a free/name-your-price download under a Creative Commons licence. 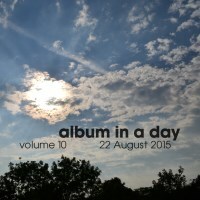 The album will be released as soon as it is ready on Monday 24th August 2015. Artists taking part often post their progress on the facebook event page, so feel free to join and spread the word! These albums are always a lot of fun. We never know what we are going to get but having so little time seems to energize musicians into creating something that some would normally work on for weeks. The result is a wonderful mix of a whole range of music from musicians around the world, all completely written, performed and recorded on Saturday 22nd August 2015. 44 tracks - over 4 hours of brand new music. A massive thank you to all the musicians who took part. Enjoy the album - and please share!